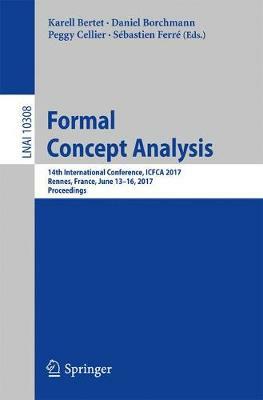 This book constitutes the proceedings of the 14th International Conference on Formal Concept Analysis, ICFCA 2017, held in Rennes, France, in June 2017. The 13 full papers presented in this volume were carefully reviewed and selected from 37 submissions. The book also contains an invited contribution and a historical paper translated from German and originally published in "Die Klassifkation und ihr Umfeld", edited by P. O. Degens, H. J. Hermes, and O. Opitz, Indeks-Verlag, Frankfurt, 1986. The field of Formal Concept Analysis (FCA) originated in the 1980s in Darmstadt as a subfield of mathematical order theory, with prior developments in other research groups. Its original motivation was to consider complete lattices as lattices of concepts, drawing motivation from philosophy and mathematics alike. FCA has since then developed into a wide research area with applications much beyond its original motivation, for example in logic, data mining, learning, and psychology.